Minh Tan Bakery also offers Macarons in different flavours, exquisite cakes and pastries. They have the usual hot pies, pasties and sausage rolls….and of course delicious freshly baked crusty breads. Their sandwiches are pack with fillings, I had tried a few and very happy with what I have munch on so far. For people who are not aware of Vietnamese Rolls….this fantastic creation is made of Toasted Vietnamese Baguette, filled with meats, butter, pâté, shredded carrots, sliced cucumber and fresh sprigs of coriander. To read the Menu, Bánh mì is the term for bread in Vietnam and what comes after it is what the main fillings inside the Rolls, eg. Bánh mì thit is filled with pork meat. The TRIBE’s favourite is Minh Tan’s Bánh mì thit (Toasted Vietnamese Pork Roll). I’ve order different versions before but we always come back to our beloved Bánh mì thit. When I was in Secondary School, my friends and I use to order our Pork Rolls in Darra but Minh Tan is the best. 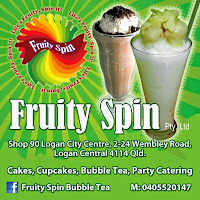 Tried also the shops in Inala Civic Centre and been disappointed, they were bland and have hardly any fillings at all. If I ask my kids to choose…McDonalds or Vietnamese Pork Rolls, they always choose the Pork Rolls. What’s not to love about it, crispy golden baked baguette slathered with gorgeous butter and pâté, filled with slices of pork (different kinds), sweet shredded carrots and crunchy strips of cucumber with sprigs of coriander and a few drops of Maggi seasoning. Not to forget, if you want a bit of a bite…you can request chilli with your Vietnamese Pork Roll. Every bite is like a party in your mouth, everything just harmonise and before you know it, you have wolfed down your Pork Roll and have crispy baguette crumbs all over your clothes…hehehehehe! Part of the experience! So now, I have divulge our TRIBE’s favourite Inala snack….so if you happen to visit Inala, remember to drop by Minh Tan Bakery and order one, and tell me if am I right that they have the best Bánh mì thit (Toasted Vietnamese Pork Roll) in Brisbane. F.Y.I~ I’m not related or connected to this business. This is one of my favourite shops that I frequently visit and the purpose of this post is to give you a sneak peek. We paid with our own TRIBE money for our foodie purchases. The prices on the Menu boards are current when this post was done and are subject to change anytime.